The marathon rail epic that is GCERC was over a year in the planning. I’ll admit that for much of that time I was turning over in my mind what exactly to take by way of photography kit. What was the most flexible set-up I could bring, capable of everything that could be thrown in front of it from deep inside the Arctic Circle, the rough end of east European cities, the hot plains of Spain and everything in between? And how would I actually carry it? Weight, speed of access, and security mattered here. I made an early decision that I’d want more than just my regular SLR kit – even with all those fancy lenses. So I splashed out (under £300) for a new, shiny Canon G15 compact. I’d use that, my 5D MkIII, and my phone (Galaxy Note Mk 1), knowing that there’d be situations in which each of them came into their own. The SLR stuff: Canon 5D MkIII full frame SLR. My regular workhorse, and something I can operate one-handed with my eyes closed. Literally. 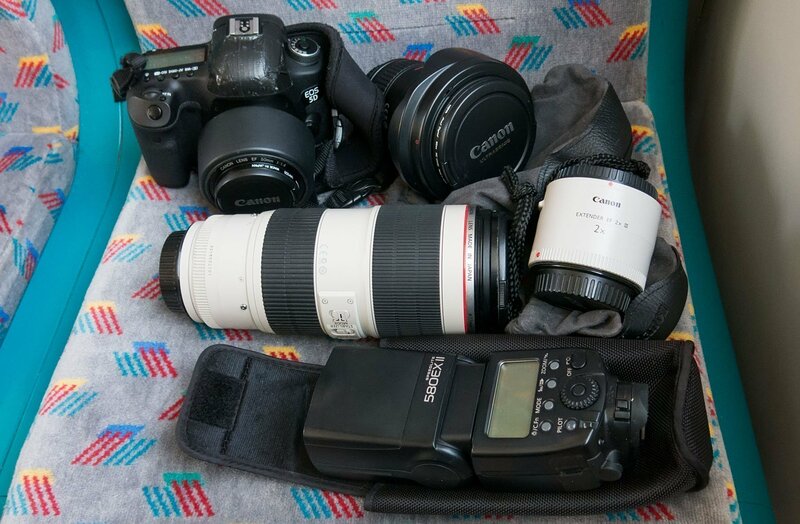 Lenses: 50mm f/1.4 prime, 16-35L Mk II f/2.8 zoom, 70-200L MkII f/2.8 zoom. 2x extender (MkIII) to turn the telephoto into a proper big 400mm beast where required. 580EXII speedlite flash. What? No mid-range zoom?! Nope. I took the call that another grand’s worth of glass in the form of my 24-105L f/4 wasn’t going to add that much to my range; I’d use the 50 and walk around a bit if required and the G15 would handle (I hoped) much of the mid-range opportunistic snappy stuff. And if everything went at knifepoint, at least I’d have another 5D and a flexible lens at home so I could carry on earning a living until the insurance paid up. 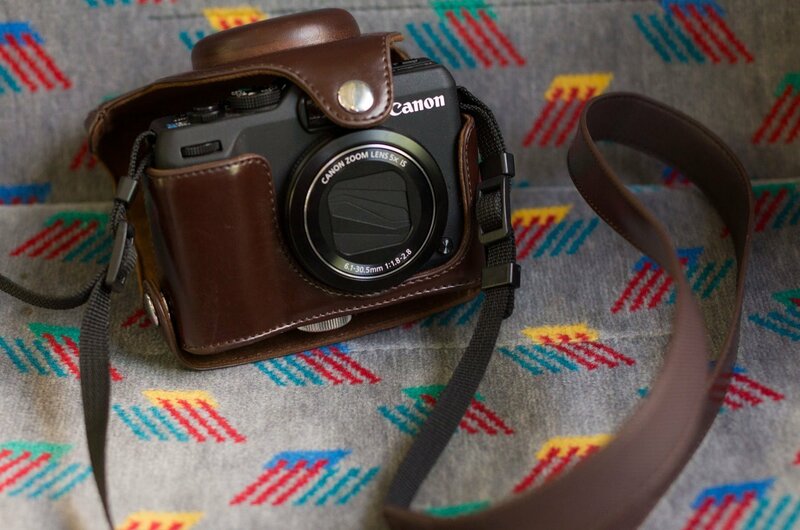 The compact camera: Canon G15 (fixed lens, zoom equivalent of 28-140mm). Nifty leather travel case. I’m really glad I got this – great quality materials and finish, and will only look better as it gets more battered. 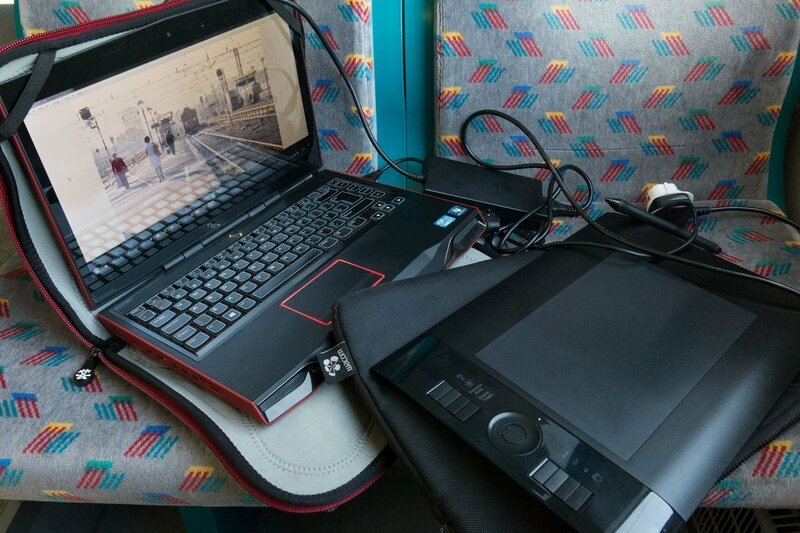 The processing: Alienware G14 laptop and Wacom A5 graphics tablet. Big and heavy, and the wrong choice for this trip. In future, a 4GB RAM thin ultrabook of some kind will do. I use the Alienware because it’s ultra fast for crunching pics on location at events. Here, time is not my enemy. 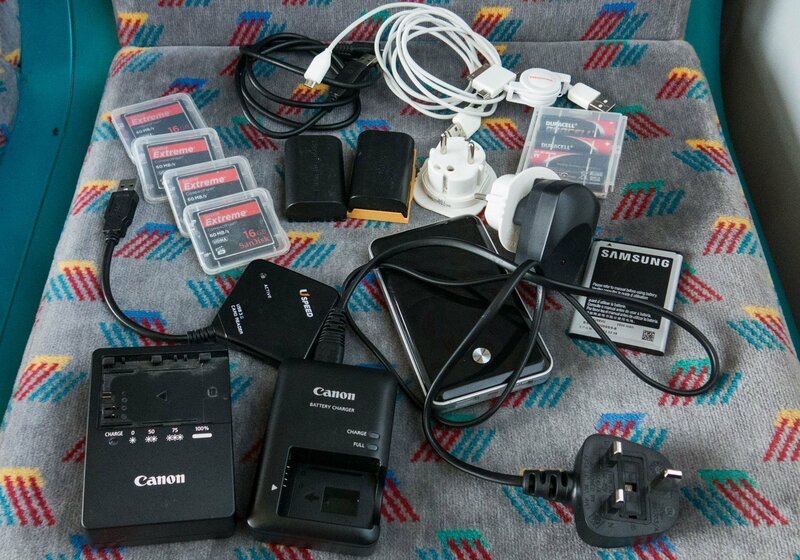 The bits: spare memory cards, USB3 card reader, 2 USB-microUSB cables, multi-purpose cable (USB-miniUSB/microUSB/iPhone), 4 AA batteries for flash, 2 spare 5D batteries, chargers for 5D and G15 batteries, mini USB brick, 2 euro AC socket adapters, AC-USB converter, spare phone battery. In terms of transportation, things got a million times easier when my photography sidekick Tracy advised me to get a ThinkTank belt, with attachable bags. That’s “advised” in the sense of phoning the shop, reserving one, and ordering me to go and pick it up two days before departure. And I’m so glad I did. So comfortable you hardly know it’s there, and with three firmly attached pouches: one for SLR, 50mm lens and the wide-angle zoom (and a lens cloth, memory cards, and oh yes, some business cards); another for the telephoto zoom (and my train tickets); and the third holding the G15, sunglasses, passport, wallet, change, Kindle, iPod and phone. Everything I immediately needed around my waist and available within seconds. Everything else in a smallish pull-along hard case. One final element to mention. This was the trip where I did a bit of a Documentally, and really appreciated my Scottevest Fleece 7.0. Sleeves came off from Sarajevo onwards when it got seriously hot, and it has a pocket for everything. I didn’t actually use that many of them, as the belt arrangement was so useful, but the main features were an inbuilt lens cloth on an elastic, handily within an inside pocket, and best of all, the ability to carry 2 litres of water in both sides at the front. Couldn’t see them, could hardly feel them, but having that sort of capacity to hand was a great comfort. That’s about it on kit – doing it again I’d try to find a slightly bigger pouch for the belt, as the SLR/lens one was a bit too tight and meant I had to attach the 50mm to the camera before it would all close properly. I’d swap the laptop for something less powerful and much, much lighter (and less power hungry), and I’d probably leave the graphics tablet behind. 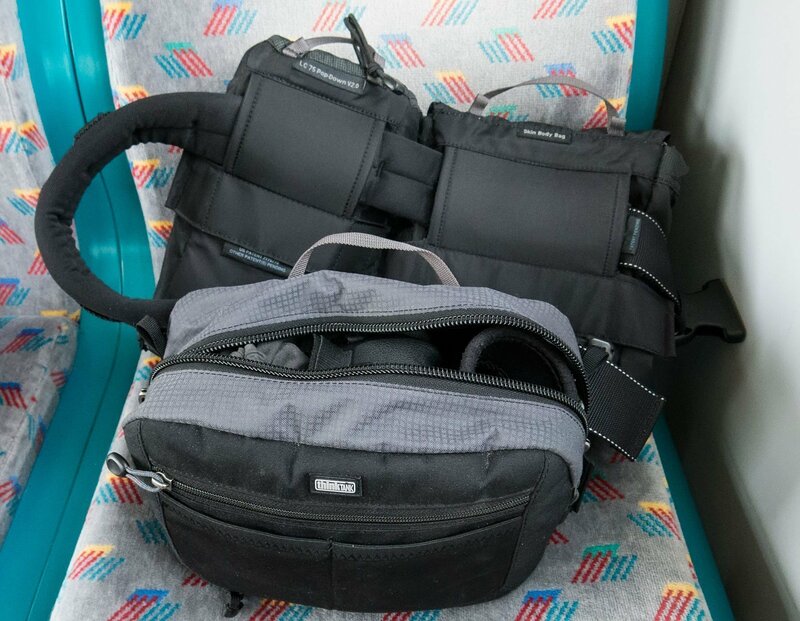 It makes a big edit so much easier, but here I wasn’t doing much retouching, and it was a case of little and often, grabbing time on trains in cramped spaces to edit the most recent haul. I’d also take a heavier duty chargeable power brick; I’d just about get two phone charges from this one, but maintaining power has been a constant struggle. The results? – here are all the picture galleries since we set off.